In this edition of Chalk-Talk, we look at game-like drill which teaches players the concept of off-side. This is a great game to get players familiar with the off-side rule, especially those who are preparing to transition to full-ice hockey. It’s also an excellent refresher drill to open the hockey season and a quick teaching game that helps players learn a simple but important concept. 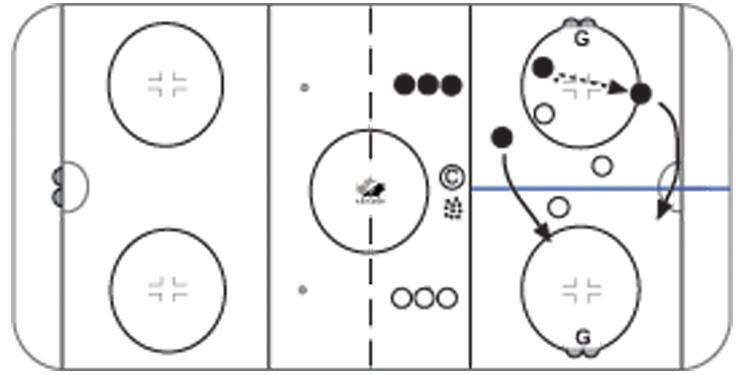 Additionally, because the drill is executed cross-ice, it sustains a high tempo and engagement for every player, as well as providing more opportunity for shooting, passing, receiving passes and performing quick changes of skating direction. Progression - A variation is to make the attacking team complete a pass before crossing the midline on-side. Once they regroup in their own zone, they can attack the opposing team, but they must attack staying on-side at the hand-drawn midline. If they go off-side, blow a quick whistle to signify a turnover. The defending team then becomes the attackers, regrouping in their own zone before attacking on-side. This edition of Chalk-Talk used video featuring the Dundas Blue Tyke MD team. Big thank you to Head Coach Chris Popek and coaching staff along with the entire Blues team – good luck with the rest of your season and have a very Merry Christmas!